The preliminary card at UFC 232 featured a Bantamweight fight between the durable Douglas Silva de Andrade and the UFC's new up and rising hot talent from Russia, Petr Yan. Following a dominant performance on the ground via short arm elbows, Yan secured a second-round technical knockout victory as the Brazilian's camp sitting on Octagon-side, threw in the white towel at the end of round number two. Petr Yan is a Russian professional mixed martial artist, currently competing in the UFC's bantamweight division. He began training in the Taekwondo discipline in just the sixth grade and continued his exploration in martial arts by following his brother's footsteps of learning how to box. Out of his ten professional MMA fights, Yan has suffered just one defeat, with his recent victories in the UFC coming against the likes of Teruto Ishihara and Jin Soo Son. Douglas Silva de Andrade is a Brazilian professional mixed martial artist who currently competes in the bantamweight division of the UFC. He amassed an undefeated professional run in his career up until his debut loss coming in the UFC against Zubaira Tukhugov at UFC Fight Night 36. His recent victory came against Marlon Vera at UFC Fight Night 125, where he beat the latter via unanimous decision at the end of five rounds. Round number one of the fight began with both fighters opening up with early leg kicks. Both Petr Yan and Silva soon sought after body kicks, initiating the pair to further indulge in an early ground game. Petr Yan was seen keeping his guard up high throughout the fight, thereby managing to avoid left hooks and high kicks. Yan then showed no hesitation in taking the rest of round number two, to the ground. After a series of well-timed short-arm elbows to the face, a nasty cut on Silva's left him bloody-faced, coming out of round two. After paying closer attention to the damage sustained by Silva from round two of the fight, the Brazilian's camp called the contest off, leading up to round number three. The victory belonged to Russia's Petr Yan after a second-round white towel surrender, probed the official decision of a technical knockout victory. 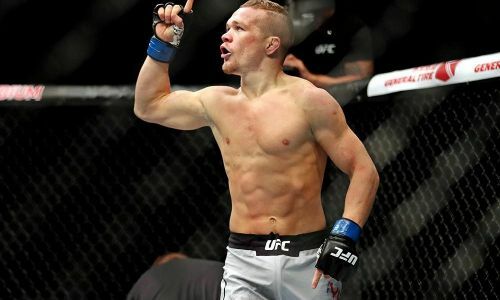 Petr Yan is proving to be a highly efficient and marketable asset for the UFC's bantamweight division, considering his recent run in the UFC. His convincing victory against Douglas Silva de Andrade seems to have raised many eyebrows, ensuring an upward trajectory for him in the sport. Who do you think should be next in line for Petr Yan? Leave your thoughts and opinions about his performance at UFC 232, in the comments section below!